yathai :: ยาไทย is an occasional blog celebrating Thai and Chinese medicine packaging design and translating their contents into English. Below are a few examples. You can see the whole thing by clicking through to the Tumblr page. For the relief of faintness, dizziness, angina, lightheadedness, and nausea. A tonic for the heart.. Adults take one teaspoon (coffeespoon) with meals, children take half as much. Dissolve in still water and lime juice, or take with fresh jasmine water 2-3 times daily, or whenever experiencing symptoms. Made in Chiang Mai city. 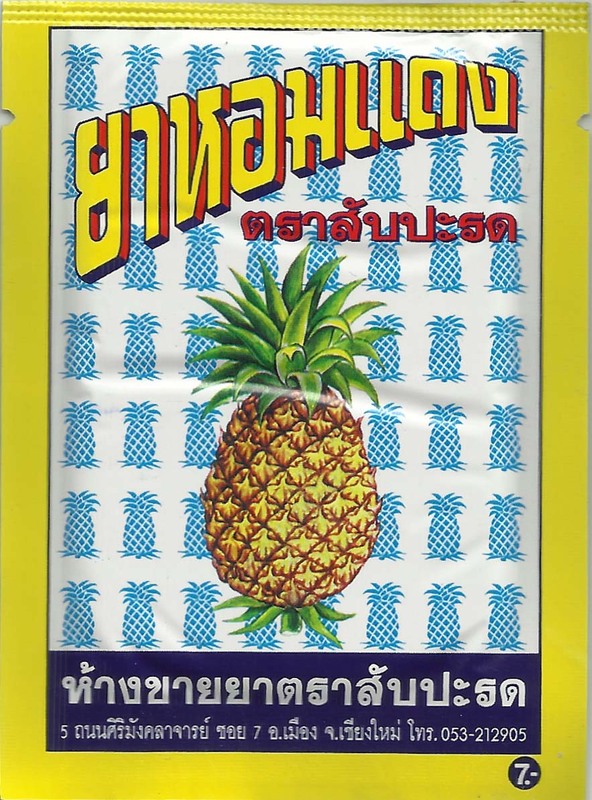 For the relief of cankers, heat of the throat, cough (caused by ขางทราง? ), child’s fever, and heat of the head. Take 1 teaspoon (coffespoon) 2-3 times a day. Made in Sankampaeng, Chiang Mai. For the relief of mouth sores and cankers, swelling of the gums, and white and/or lacerated tongues in children. Made in Mae Rim, Chiang Mai. 10 baht.